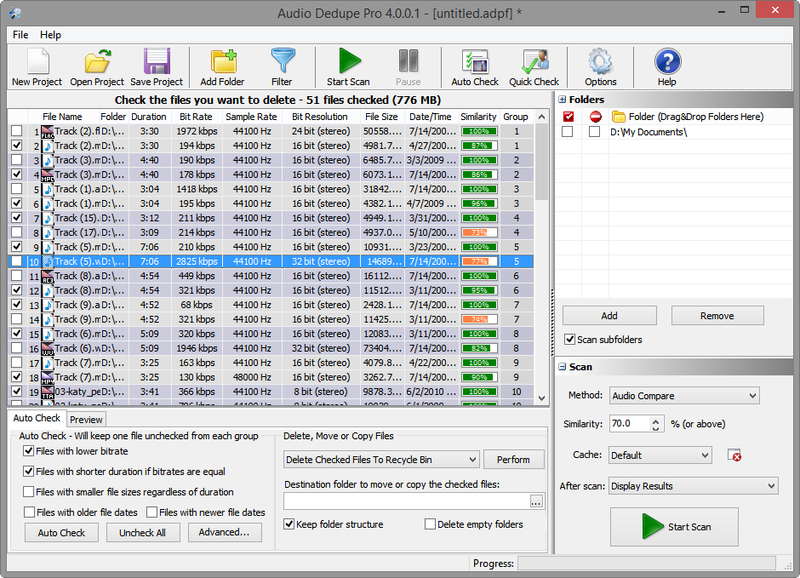 Audio Dedupe is popular for its features that go beyond the standard duplicate file finders. Audio Dedupe can find similar and duplicate songs regardless of the file format. It analyzes the files and “Listens” to the audio file in order to find similarities. It can identify exact duplicates or remixes of the same song stored in various audio file formats. The tool supports most of the popular aduio formats and will put an end to the mess in you music collection, iTunes, iPod, iPad, iPhone or other mp3 player devices. Here are some of the supported file formats: Supports MP3, MP2, MP1, MPA, WAV, OGG, AIFF, AAC, MP4, FLAC, AC3, WavPack (WV), Musepack (MPC) and Windows Media Audio (WMA) file formats. The filtering panel provides a handy new option that makes it possible to filter folders by a phrase including wildcards. If the text “original” is entered – all the folders that contain “original” in the name will be matched. Vertical line e.g. : “copy|backup|bckp” can be used in order to specify and combine several phrases. Using the above example all the folders that contain “copy”,“backup” or “bckp” will be matched. A more sophisticated example is “b?? (*)*” – it will match all folders starting with “b” followed by two characters then an opening bracket followed by one character and then a closing bracket followed by any number of characters. Exclusion from “Auto-check” or from “Self-scan” can now be set for all folders in the list by clicking on the header of the corresponding column. The browse for folder dialog is also updated. If no folders are checked, the currently selected folder is added. This makes it easier to add a single folder to the list and saves the extra click to check it. “Keep Folder Structure while moving files” is now optional. In previous versions of Audio Dedupe it was ON by default. 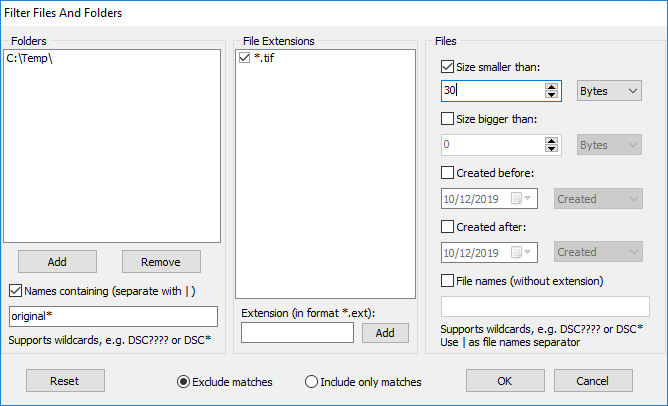 Name conflicts in cases where there are more files with the same name from different locations that should be moved to the same backup folder are also solved. If the file “Intro.mp3” for example is moved to the same folder from multiple locations the extra copies will be moved with the name “Intro (1).mp3”, “Intro (2).mp3” and so on. While it does not make much sense if the source files are exact duplicates it is useful to preserve the source files if they are similar versions, but not 100% duplicates. This entry was posted in Audio Dedupe and tagged audio duplicate finder, delete duplicate music files, Duplicate File Finder, Duplicate Mp3 Finder Freeware, duplicate music file finder freeware, duplicate music file finder mac, duplicate music file finder review, Find Similar Music, find similar music albums, find similar music app, find similar music by song, find similar music by sound, Find Similar Songs, Find Similar Songs By Song, Find Similar Songs By Sound, Find Similar Songs On Itunes, Find Similar Songs Online, Find Similar Songs Search Engine, Find Similar Songs Spotify, Find Similar Songs Website, helps you find similar music, music genome project, music web find similar music, Organize Music, organize songs by bpm, organize songs computer, organize songs in itunes, organize songs on iphone, organize songs on ipod shuffle, organize songs on ipod touch, organize songs on itunes playlist, remove duplicate music files, sort songs by date added iphone, sort songs by track number itunes, sort songs in itunes, sort songs in itunes by date added, sort songs in playlist iphone, sort songs in spotify mobile, sort songs on iphone, sort songs on ipod on November 26, 2014 by MindGems Support.